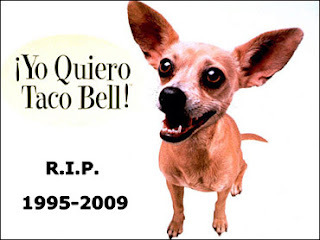 Sadly, we lost one of the most popular advertising dogs in recent years today. Gidget the Taco Bell Chihuahua died of a massive stroke (no relation to eating Taco Bell I'm sure) and has moved on to the big taco stand in the sky. She (yes it was a she) became part of our pop culture in 1997 with the now classic "Yo Quiero Taco Bell" ad campaign which had all of us mumbling the phrase whether we really wanted Taco Bell or not. Other catch phrases this pint size pitchman drilled into our collective heads included "Drop the Chalupa! ", "Viva Gorditas!" and the classic, "I'm thinking you, me...... burrito!". Honestly could you ever imagine a time in your life where you thought you'd ever have the need to utter any of these phrases? Yet, we did. Even SportsCenter was hooked on the Chalupa phrase for a while. And oh, how we laughed. One company that didn't laugh to loudly though was Taco Bell themselves. It seems they ripped off the idea from a couple of guys who pitched the idea six years earlier and then went with another ad firm to produce the campaign. The guys sued and $32.1 million dollars later, all was forgiven. Taco Bell went on to show real class when they went after the ad firm that produced the campaign trying to blame them for the oversite - a three judge panel dropped the Chalupa against Taco Bell. Any idea how many burrito supremes and super value menu items you need to sell to recoup those grande sized judgements? Mucho. So we bid farewell to Gidget and hope she finds peace wherever she is. Thanks to the internet, her legacy will live on. Pass the Pepto.